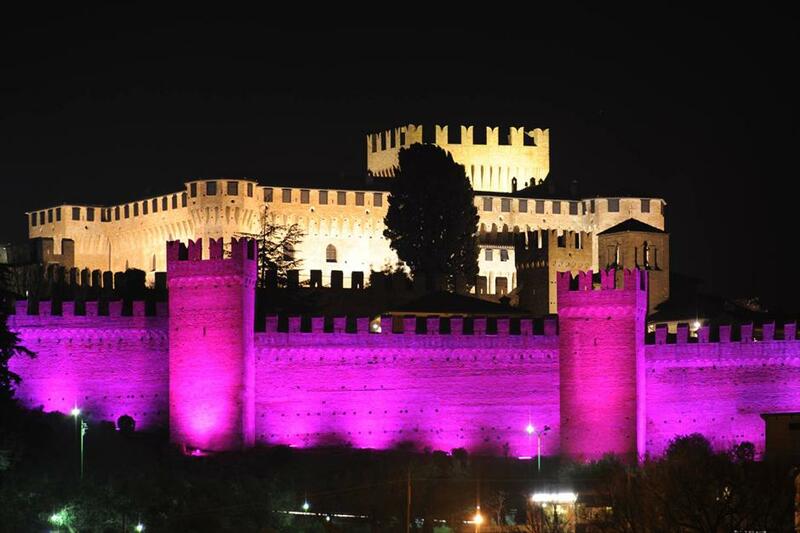 The ‘Pink Night 2015’ has confirmed that there are few places on earth as charming as the Gradara Castle. Fascinating daytime for the grandeur of its medieval military architecture, from sunset on the Castle has enchanted thousands of visitors to the magic of the place, suspended between myth and history, such as the ill-fated love between Paolo and Francesca, which Dante Alighieri made immortal with his verses. A seduction made even more tangible by the beautiful show of its extended walls lit in pink, which suspended the castle between heaven and earth, against the beautiful backdrop of the Adriatic Sea coast. The challenging lighting installation was carried out by the rental company ‘LED Light’, which installed a network of FOS 100 LED bars (to wash the walls) and TITAN LED projectors (to highlight the architectural details) by DTS, all IP65 for outdoor use in any weather conditions. The FOS 100 bars, fitted with asymmetrical optics, have been arranged parallel to the walls at a distance of 1.2 m. The network was powered by Z8 power supplies, and managed by a STICK controller.